The connection with Erling Strom at Banff Trail Riders meet with curiosity and convenience. Both curious about what was out there to explore and show guests, and both keen to provide convenience for guests on trips. 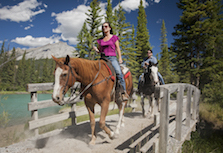 New to Horseback Riding? This is For You.